Tunis – IOM, the UN Migration Agency, the Danish Refugee Council and the International Detention Coalition recently (1-2/10) held a two-day meeting to explore alternatives to migrant detention in Libya. The meeting, held in Tunis, brought together representatives from Libya’s Ministries of Foreign Affairs, Social Affairs and Labour plus the Directorate for Combatting Illegal Migration (DCIM) within the Ministry of Interior. Also in attendance were representatives from the African Union, diplomatic staff from eight African countries, Bangladeshi and Pakistani embassy representatives and participants from international NGOs and UN agencies. The meeting, funded by the US State Department’s Bureau of Population, Refugees, and Migration (PRM), and UK’s Department for International Development (DFID), provided an opportunity to discuss alternatives to detention with Embassy representatives, as well as how to address challenges facing diplomatic staff with regards consular procedure for migrants in detention. Embassy representatives prepared a statement of principles, which was presented to the Libyan authorities on the second day of the workshop. The embassies emphasized the constraints they face in accessing their nationals in detention and called for improved collaboration with Libyan authorities and international organizations to find alternatives to detention that comply with Libyan law. While the situation in Libya is complex and migration has many drivers that require efforts in the countries of origin, transit and destination, there are immediate practical steps that can be taken, emphasized Junita Calder, the International Detention Coalition representative. These include introducing screening mechanisms, ensuring referrals and adopting a case management approach. With embassies on board to assist in this effort, there is an even greater likelihood of success, said James Martin, Head of Programmes, Danish Refugee Council. 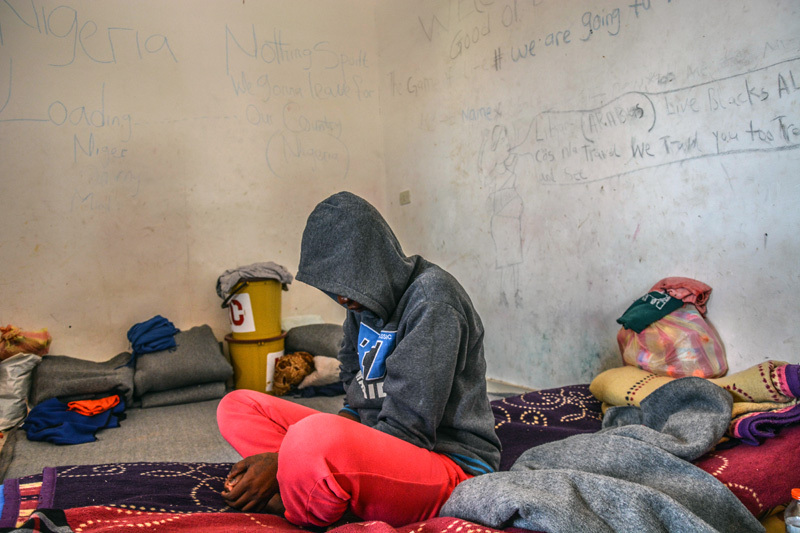 Karolina Edsbacker, IOM Libya Protection Officer, praised ongoing ad-hoc initiatives of the diplomatic community in Libya to find alternatives to detention. “Community housing and other safe alternatives need to be further developed outside of detention and, for this, the collaboration with the embassies is key,” she explained. “It is important to keep in mind that the detention centre question is only one component of a wider discussion on the widespread phenomenon of migration,” said Marwan Ali Bousriwel from the Ministry of Foreign Affairs, acknowledging that migration management cannot be the sole responsibility of Libya but should also include countries of origin, transit and destination. Maya Fadel Sahli, representative from the African Commission on Human and Peoples’ Rights within the African Union presented examples from countries in the region which have tried out alternatives to detention. At the end of the workshop, she welcomed that diplomatic representatives and the Libyan authorities had reached a consensus on the necessity of alternatives to detention in Libya. A workshop report, which will outline best practices presented by the embassies and include recommendations on ways forward will pave the way for next discussions on alternatives to detention between the key stakeholders. This data driven tool has been developed to provide a quantitative and action-orientated tool that delivers routine multi-sectoral profiles on select DCIM detention centres in Libya. By selecting a specific detention centre from the dropdown list at the top of the page DTM’s Detention Center Profile generates a PDF printable factsheet presenting an overview on the total number of women, men and children held in each detention centre on the day the of the assessment. The factsheet also presents a total breakdown of the nationalities detained in each Center as well as a multi-sectoral overview of the primary needs and vulnerabilities relating to health, WASH, food, protection and access to information. • The Detention Center assessment forms. This file contains Libya detention centre profiles for Abusliem, Al Kufra, Benghazi al Wafiah, Gharyan al Hamra, Shahhat, Tajoura, Trig al Matar, Trig al Seka and Zilten. The displayed information concerns the detention centre, demographics and shelter, vulnerable populations, main nationalities present, and sectorial data (health, WASH, food, protection, site facility information, access to information and information sources).